you are here: Home » Book Chat / Featured » What Book Got You Hooked? “What Book Got You Hooked?” invites readers everywhere to celebrate unforgettable books from childhood and help provide new books to the children who need them most. First Book asks visitors to share the memory of the books that made them readers and then vote for the state to receive 50,000 new books from First Book, helping to get more kids hooked on reading. Past winners include Oklahoma in 2007 and Kentucky in 2008, with each state receiving 50,000 new books for children in need. Head over to their website where you can vote for your favorite childhood book and read about some celebrity favorites. John Krasinski’s pick is James and the Giant Peach while Neil Patrick Harris selected Bridge to Terabithia. 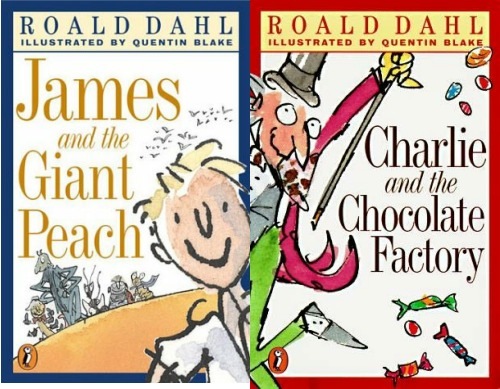 It’s hard to narrow it down, but I think the book that got me hooked on reading was Charlie and the Chocolate Factory. I think the chocolate room where everything was edible, including bushes that grew lollipops, giant mushrooms full of whipped cream, and the chocolate river, really inspired my imagination. What kid doesn’t like a story all about candy? The story has a good lesson in it too, as all the bratty kids get kicked out of the factory for misbehaving and Charlie gets rewarded for being a good kid. To this day I wonder why three-course dinner chewing gum hasn’t been invented yet?